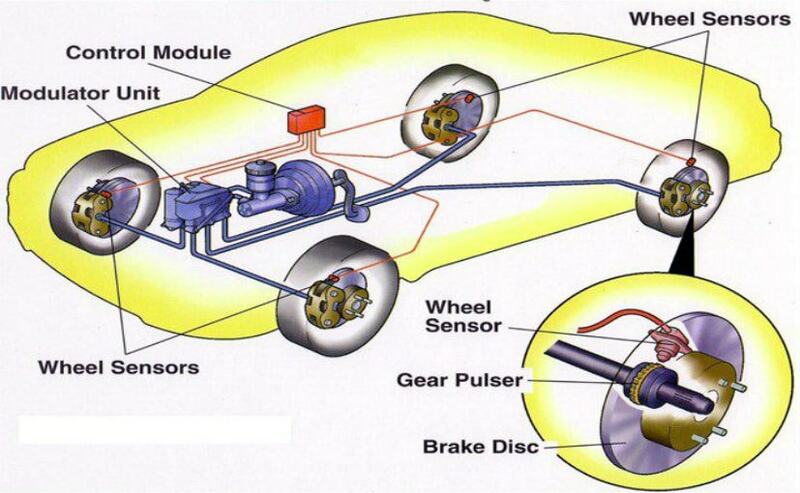 What is EBD (Electronic Brake Force Distribution) and How Does It Work? Most of the cars today come fitted with ABS or Anti-lock Braking system. Coupled along with ABS, there is another electronic marvel called the EBD or electronic brake force distribution. Simply put, EBD is a system wherein the amount of braking force on each wheel of the car can be varied taking factors such as load bearing on each wheel, condition of the road, speed of the vehicle and so on. The simple idea behind an EBD system is that it need not be necessary to apply the same amount of braking force on each wheel so as to reduce the speed of the car or bring it to a complete stop. An EBD system makes use of three components which make it tick. The speed sensors, brake force modulators and electronic control unit (ECU). 1. Speed Sensor: The speed sensor not only calculates the speed of the car, but the speed of the engine also (RPM). One of the scenarios can be that the speed of the wheel might not be the same as the speed of the car. Such a situation can lead to the wheel(s) skidding. The speed sensors calculate the slip ratio and relay it to ECU. 2. Electronic Control Unit: It is a small chip which collects the data from the speed sensors in each wheel and uses the data to calculate the slip ratio (difference between the speed of the car and the rotation of the tyre). Once the slip ratio is determined, it makes use of the brake force modulators to keep the slip ratio within limits. 3. Brake Force Modulators: It is the job of these modulators to pump brake fluid into the brake lines and activate the brake cylinders. The brake force applied on each wheel can be modulated. All these three components work in tandem and make the EBD work and save your day, every time you brake hard.